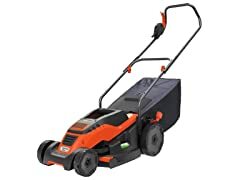 $266.21 GreenWorks 25302 Twin Force G-MAX 40V Li-Ion 20-Inch Cordless Lawn Mower with 2 Batteries and a Charger Inc. - dealepic . 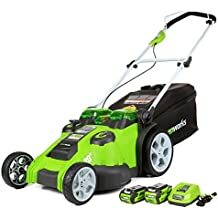 This GreenWorks 25302 Twin Force G-MAX 40V Li-Ion 20-Inch Cordless Lawn Mower features G-MAX 40V Li-Ion Battery System powers multiple tools for complete yard work system–includes 2 Batteries and Charger, 20-Inch cutting deck offers a great balance of maneuverability and cutting capacity making it ideal for mid-sized areas, an innovative Smart Cut technology that adjusts for power or runtime based on the thickness of your grassDual blades offer better cut quality, superior mulching and bagging capabilities. Automatic battery switchover pulls power from the second battery once the first is depleted to eliminate downtime.